So, by the end of the previous post on Mathematica and Graph Theory, we had managed to take our single string of text and turn it into a graph of ingredients where nodes linked by edges go well together. Now we actually want to do something useful with this data – ie. come up with some recipes! We will refer in the following to foodgraph as the graph of all of the food pairings we started with. We will define a recipe very loosely as a set of ingredients all of which go well together. This is clearly far from a real recipe, but it’s a pretty good starting point for one. So, by the end of the previous post on Mathematica and Graph Theory, we had managed to take our single string of text and turn it into a graph of ingredients which go well together. Now we actually want to do something useful with this data – ie. come up with some tasty recipes! If you go to the Wikipedia page for the list of mathematics societies, you will see that very few societies within Africa are shown. A very quick Google search shows that many countries do indeed have their own mathematics society, so it would be great to try and find out which ones are active. If you know of an active society for a country which is not in the list (currently only South Africa and Gabon are listed as far as I can see), then please write it in the comments, we can collate them, and upon contacting them and asking whether they want to be listed on the wikipedia page, we can put in their details. Please spread the word and let’s see if we can get a few more societies highlighted. Mathemafrica poster – please spread the word! 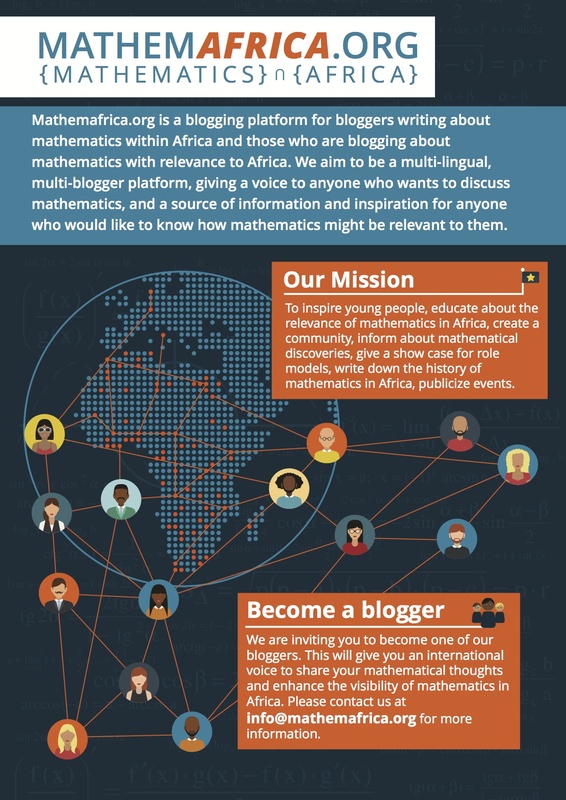 Our very talented web developer Adam has designed a poster to advertise Mathemafrica.org. If you are in a mathematics department anywhere within Africa, or a highschool where you think this might be of interest, please think about printing the poster out and putting it up. If you would like to translate the poster into another language, we would also very much appreciate your help! Eventually we want to make this a multilingual blogging platform. Some of the translations of the framework are in, and we hope to have the structure implemented soon. In addition we would love to get people blogging in other languages, and to get some of the current content translated. The multilingual nature of South Africa is a very important issue in terms of education and there will be a conference focusing on this in August at UNISA. Check it out here. The following post is written by John Webb from The Department of Mathematics and Applied Mathematics at The University of Cape Town. With his permission I include it here as an advert for a book which is discussed at the bottom of the post. Mathemafrica receives no payment for including this text. I hope that in addition to being an advert for the book, this may be a chance for students to discuss some of the problems they see with the transition between school and University here in South Africa for maths students. Why do so many first-year students fail varsity maths?